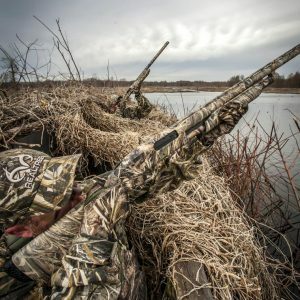 Want to learn the art of duck hunting? Great! For many people, duck hunting is a lifelong passion. If you are new to duck hunting, you probably have a lot of questions and are looking for some tips to get started. Well, you are in the right place! This article will answer many of the basic questions asked by new duck hunters. Having the right camouflage is an important first step. Camouflage all depends on where you are going to be hunting. For example, camouflage doesn’t matter in a layout blind because you are already concealed. If you are going to be hunting a dead grass area, use a lighter grassy camo. If you are going to be hunting in the woods, a leafy, bark-like print is what you’ll want to go for. Great! Now that you’ve got your camouflage, let’s next talk about keeping dry. Clearly, ducks like water, so you’ll need to be prepared to get wet. Even if you aren’t standing in the water, you might get wet from putting out decoys or sitting in the rain. So, you’re going to need to find a good pair of waders. Find an insulation that fits the temperature where you’ll be hunting. I would suggest a more breathable style because you can always layer more clothing under your waders. You won’t find a single set of waders that is ideal for all conditions. If you value being comfortable and dry(ish) at all times, you will likely need to consider purchasing more than one pair to get you through the season. The standard gun for duck hunting is a 12-gauge shotgun. Some hunters will use a 20-gauge for a challenge, but the safe bet for a beginner is to stick with the tried-and-true 12-gauge, as long as the person’s frame can handle it. A semi-automatic shotgun will make your life a bit easier, but a pump-action shotgun will also do the trick. The law requires that you use non-toxic shot while hunting. Choose your shot size to match the species you are hunting. When hunting teal, consider using a smaller pellet. Choose a number three or four shot when shooting faster and smaller birds. When hunting mallards or similar sized ducks, shoot with a number two shot—this will give you the knockdown power needed for the bigger birds. Always use steel shot ammunition as lead is not permitted anywhere. Don’t forget about shotgun chokes. Chokes are an add-on to a gun. The choke screws into the bore at the muzzle of the shotgun. 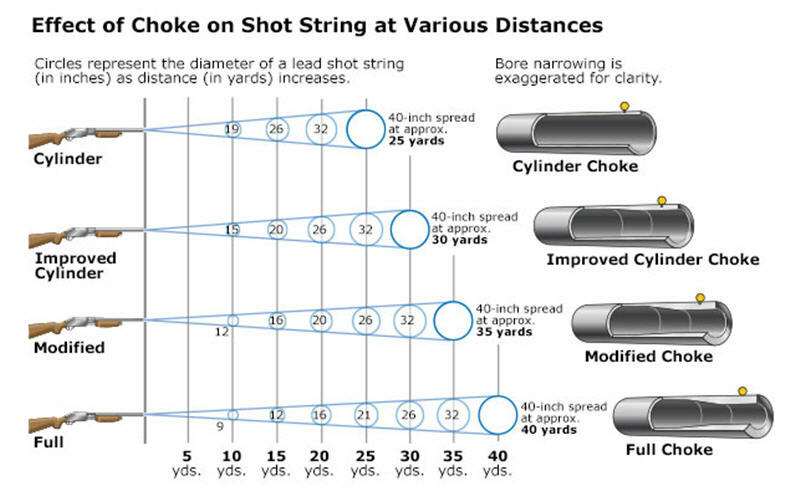 Different types of chokes can affect the shot pattern to stay tighter for a longer shot or spread in a shorter distance for a closer shot. Selecting the type of choke to use all depends on where you are hunting. If the ducks are going to be finishing right in your face, a cylinder choke will work great. If the ducks are going to be finishing 30 or 40 yards out, you may require a modified choke. Try to match your choke to the area that you are hunting and where the birds will be finishing. For more information on chokes, check out this guide. Decoys are a huge part of duck hunting. For your first set of decoys, you want to strive for the best quality for the price. The priciest decoys are not necessarily the best decoys, and they can’t guarantee that you will kill more ducks—many people have killed a lot of ducks over a painted gallon jug! It can be discouraging to see a pack of full-body ducks priced close to $120 for six decoys, but don’t give up! They aren’t all that expensive. Companies like RedHead and Higdon manufacture sets of a dozen floaters that sell for around $40. When considering different types of decoys, know that you will benefit from having motion in your decoy spread. Motion is something that causes a ripple in the water or movement in the decoys. The reason that motion is important is because a group of two or three dozen real ducks do not sit still. A live duck will flap its wings and swim around, and the challenge is to imitate that with your decoys. 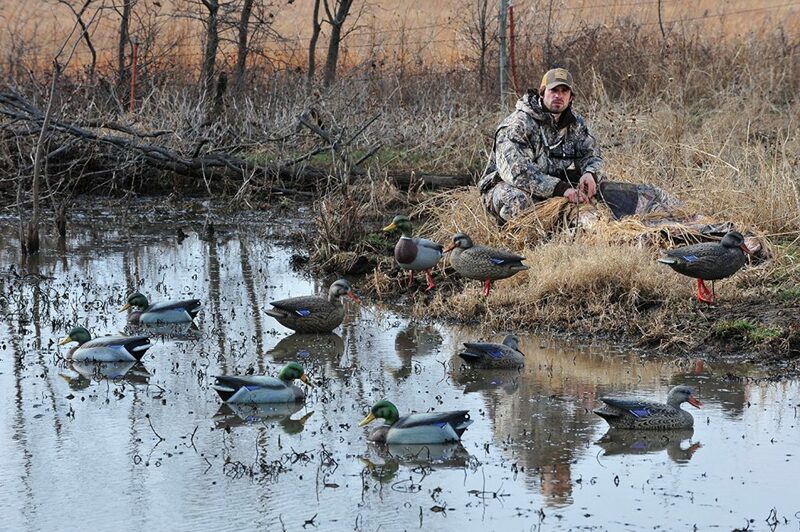 You want the ducks to think that your decoys are live ducks. A simple but very effective motion decoy is a “robo-duck,” also called a “mojo.” These decoys can create water currents and some have constant wing motion. Another option is to go the DIY route by making a jerk rig (here’s an example from Ducks Unlimited). A jerk rig creates current and movement in the decoy spread, but that little bit of motion can make the difference between ducks finishing in your face or circling eight times before buzzing off. Should I Go Duck Hunting By Myself or with Another? You will gain experience and skill more quickly by hunting with someone who has duck hunting experience! Find a friend or relative—anybody who hunts responsibly and legally—and go out with them. The best way to grow your knowledge is through others with more experience. They know how to do things, and you will learn by observing them. By first going out with someone else and seeing how they operate, your first hunt will have a much better outcome. If you don’t have friends who hunt, consider going out on a guided hunt. Guided hunts are led by professionals that typically will have high success rates. They typically will have great pointers for new and experienced hunters alike. Where Can I Duck Hunt? A common beginner method is going online and finding the closest public hunting land to go to. Sometimes, this works out just fine—but what happens when there aren’t any ducks? One of the keys to a successful duck hunt is scouting. You can be the best duck caller around and have the prettiest decoy spread, but it simply doesn’t matter if there are no ducks. Go for a drive with an experienced friend or relative and look for fields and waterways where there are ducks. Most ducks have a roost, a place where they sleep at night and is practically their partial home. Ducks also have hang-out spots and feeding areas. You can be the best duck caller around and have the prettiest decoy spread, but it simply doesn’t matter if there are no ducks. A big tip is to not hunt the roost unless you want all of the ducks to take their roost elsewhere! Ideally, you’ll want to hunt in feeding areas or areas where they are hanging around. A traffic way is where ducks will be flying over from place to place, which can be just as good as the feeding or loafing grounds. Ducks behave by going from their roost to places where they feed; they will feed mostly during morning and evening hours. Because ducks are likely to return to their feeding spots on subsequent days, it’s important to note these areas. This simple technique is called “finding the X”. The “X” is where the ducks have stopped feeding the day before and are likely to come back again. Marking the “X” is a simple as setting a bucket or something visual on the spot so you can find it the next morning. Now that you have scouted a spot, you need to get permission to hunt there. It’s a common practice to ask people if you can hunt on their property, but it’s not always a successful endeavor. To increase your chances of obtaining permission, take your presentation seriously. Try to look nice and smile; remember that first impressions last a lifetime. Wear regular clothes as opposed to hunting gear, and leave your guns at home. Ensure the property owners know that you will follow any and all rules that they may have and that you will treat their property with respect. When you go hunting on their property, be generous and take them a dressed duck or two to show appreciation. Another way of securing a spot to hunt is by leasing or buying places to hunt. You can also look into public-access areas. Many areas offer access to refuges, public lakes, and land for people to hunt on. It is easy to look up for those online or talk to a wildlife officer about the process. Wildlife officers typically will know where the ducks are, and they are almost always happy to share that information. No matter what you do, be where the ducks are for the best results. Ensure that you comply with all state hunting laws and regulations. Duck hunting is highly regulated and high fine amounts are assessed when regulations are broken. Make sure you complete your hunter education; have the right licenses or permits; and know your state rules and regulations, bag limits, and possession limits. Remember, have fun when you are out there! If you kill up to your limit, that’s truly a successful day! If you only are able to get a few ducks, still enjoy and learn from those times. The great thing about duck hunting is it brings people together. If you can’t find an experienced hunter to go with, go with a fellow beginner. You will both learn the ropes together! Keep the tradition alive, and remember—shoot where they’re going, not where they’ve been. Duck calling can be very humbling for a beginner. When your calling scares the ducks off—which most likely will happen if you are just starting out—you will feel like you need to take up a new hobby. Keep practicing! The more you practice, the better you are going to be. Duck calling is almost an art—you have to know what to do, when to do it, and how loud or how soft your call should be. There are many ways to start into duck calling, but one of the easiest is to watch instructional videos. There are so many great free videos on YouTube. You can buy instructional videos or even get enrolled in a calling class. Above all else, practice is the key to improving your call success. One of the greatest pet peeves of veteran duck hunters is termed “skybusting,” or shooting at birds that are well out of range (distances over 35 yards). Shooting at birds out of range can cripple birds and ruin hunting for others. As a beginner, it’s important that you understand how frustrating this behavior can be to others in your vicinity. A good rule of thumb is to wait to shoot until you can clearly see the eyes of the bird. Most hunters allow ducks to land and then flush them before shooting. That is truly fooling a duck. About the Author: Reid Strobl is an avid outdoorsman with a passion for waterfowling. When he’s not fishing, he’s out in the field honing his skills as a hunter. Reid has a passion for passing on what he’s learned to other young hunters.